Siamo in un’epoca in cui la politica energetica è dettata da trattati e gli obiettivi, nessuno dei quali sono radicati nella scienza, ingegneria, fisica o dell’economia. E ‘tutto reso possibile semplicemente chiedendo che il pubblico paga. Questo è un gioco giocato da burocrati elite a scapito del benessere pubblico, e distruggendo la sicurezza energetica. Il pubblico ha iniziato a combattere! Last week I gave a talk at The Scottish Oil Club in Edinburgh that was well received. The slide deck can be down loaded here. Since then we have been on high blackout alert since the UK weather has turned cold, wet and snowy with little wind at times. And there are 20 nuclear power stations closed in France creating an import shortage. This post summarises my talk using 14 out of 36 slides. 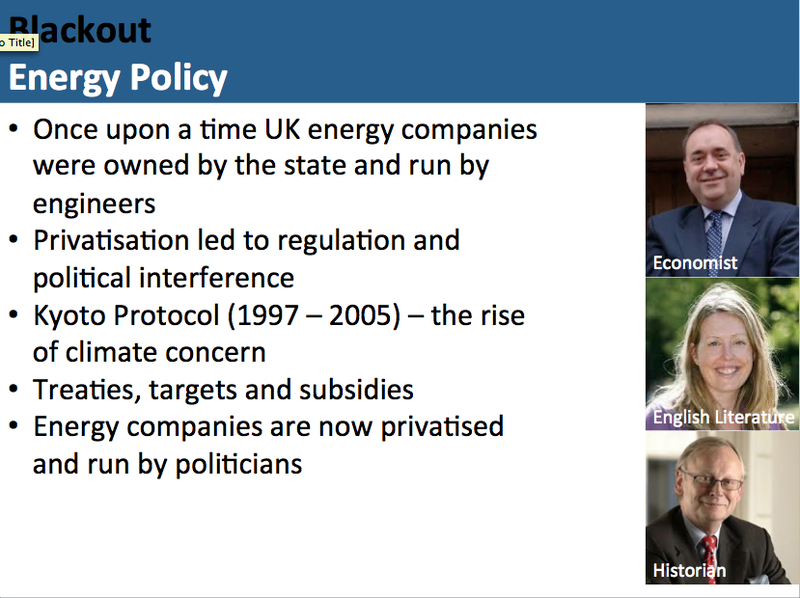 Privatisation of the energy companies led to regulation and political interference. Once run by engineers, energy policy is now dictated by arts graduates. The three figures are Alex Salmond, former leader of the SNP, Baroness Worthington who was the lead author on the UK 2008 climate change act and member of Friends of The Earth and Lord Deben (John Gummer), chairman of the Climate Change Committee that informs energy policy. We are in an era where energy policy is dictated by treaties and targets, none of which are rooted in science, engineering, physics or economics. It’s all made possible by simply demanding that the public pays. 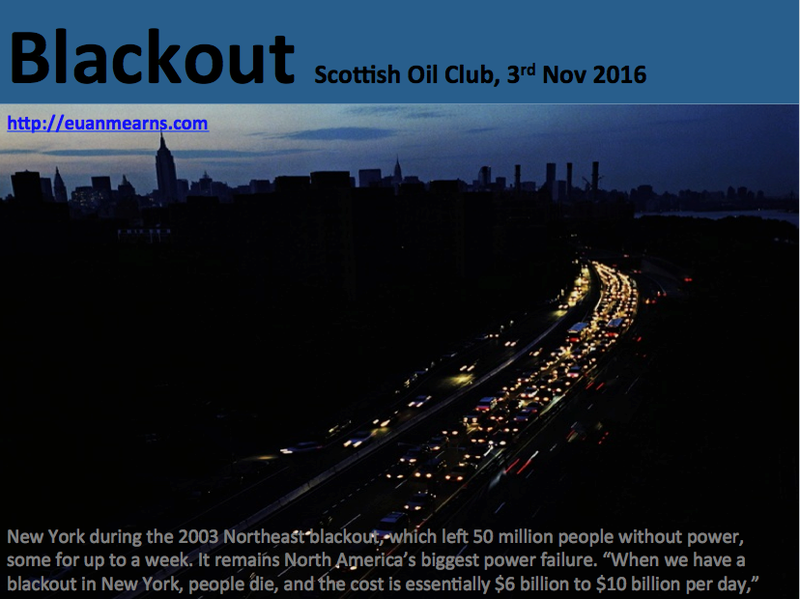 This is a game played by elite bureaucrats at the expense of public well-being, and wrecking energy security. The public have begun to fight back! 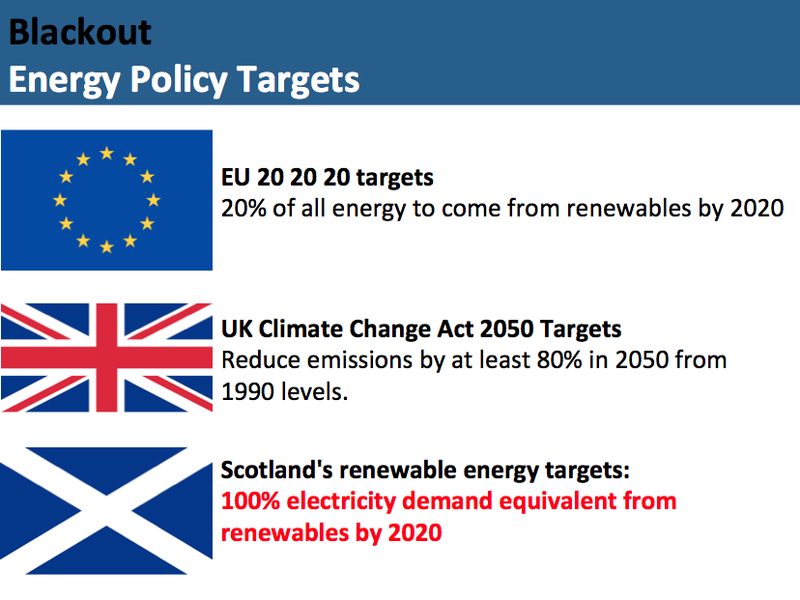 Scotland currently leads the World in tennis and in bidding for the highest percent possible of renewable energy production. Erecting solar panels on north facing roofs in one of the darkest countries on Earth epitomises how low the intellectual level of our politicians and academics has sunk. Wind turbines everywhere are despoiling our landscape that was once one of our main assets. 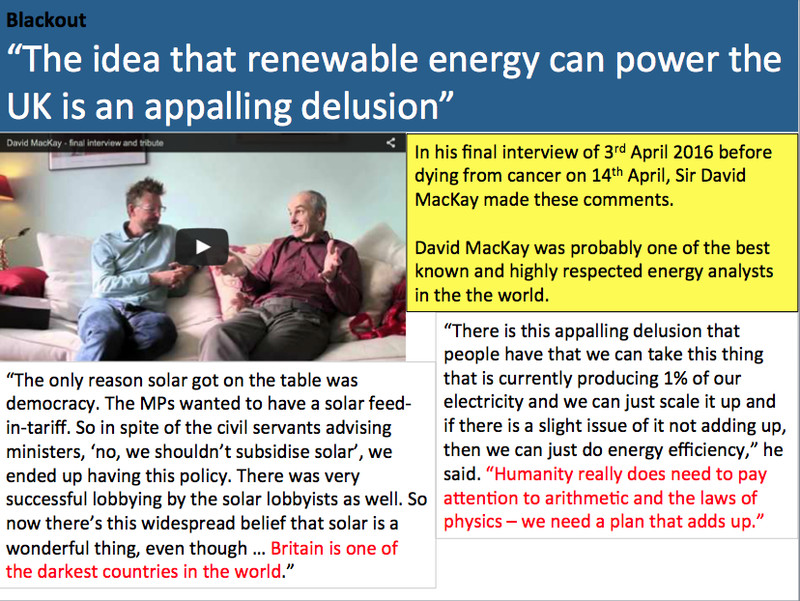 David MacKay did us a great service in his final interview before he died earlier this year stating “The idea that renewable energy can power the UK is an appalling delusion” from which I conclude that the fools in Holyrood and Westminster are deluded. 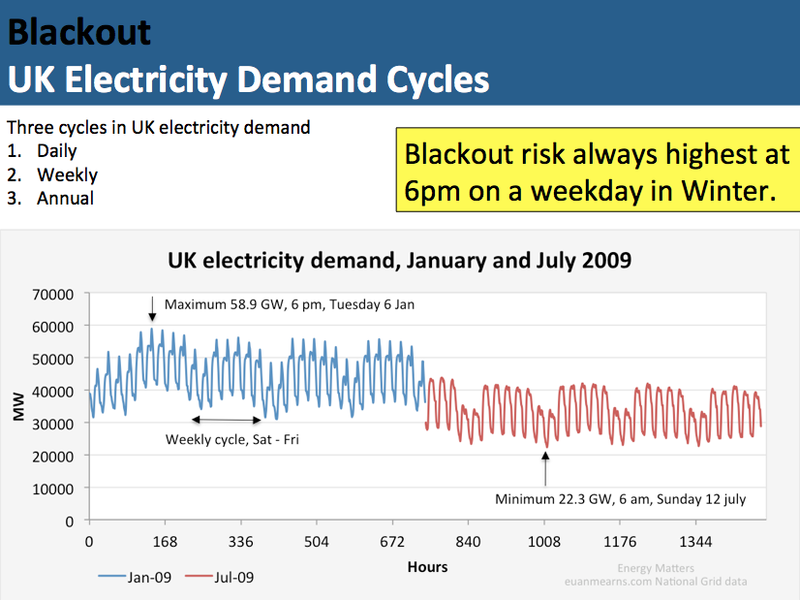 UK and Scottish electricity demand follows three distinct cycles: 1) daily, 2) weekly and 3) annual. Supply must be continuously adjusted to match demand exactly and this is only possible using dispatchable sources that can be switched on and off and up and down. Renewables do not fit this ticket. Peak winter demand is almost three times the summertime low and always occurs around 6 pm on a weekday in winter. That is when we must muster all our generating assets to ensure adequate supply. 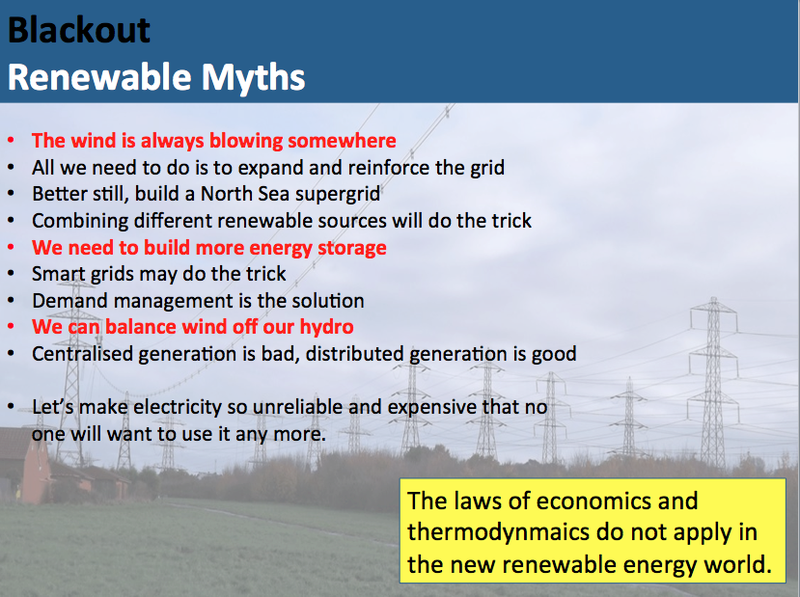 Nine renewable myths are listed, those in red have individual slides in the slide deck for those who are interested. These are a product of Green Thinking. Green Thinkers work by deciding first how they want the world to be and then simply make things up creating a pseudoscience that other Green Thinkers rally behind and repeat so often that everyone else believes it must be true. In reality the pillars are salt, and no matter how many of these pillars one erects, it can never produce a robust structure. For example, where is the evidence that large centralised generating plant is bad? The advanced society we enjoy living in was built on the back of large centralised generation – it must surely be good! The maps show the configuration of Scottish generation in the early 2000s (left) and in 2017 (right). Note that Dounreay breeder reactor actually closed in 1994. 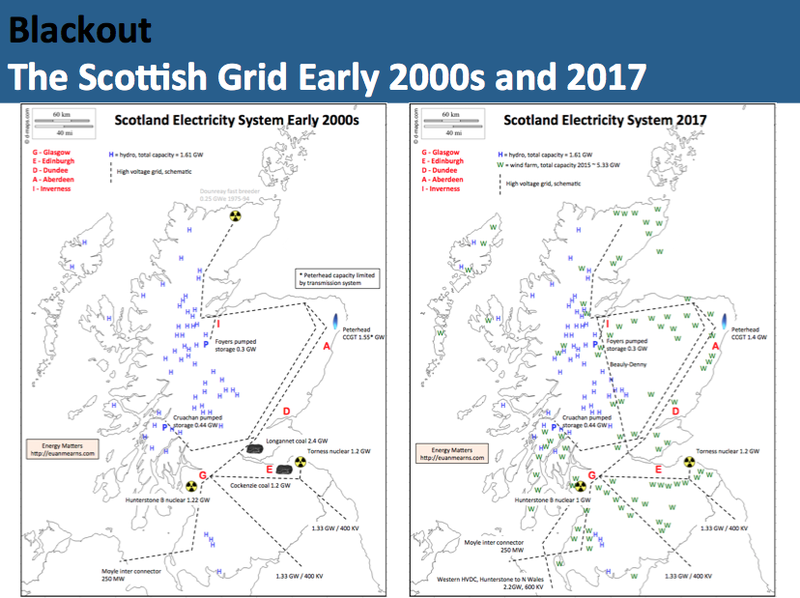 In the early 2000s we had two nuclear reactors at Hunterston and Torness, two coal fired power stations at Cockenzie and Longannet, a gas fired station at Peterhead, a suit of hydroelectric power stations and two interconnectors with England. Come 2017, both coal stations are closed. The closure of Longannet (2.4 GW) in March this year prompted the call from the Scottish Oil Club since this station was the beating heart of the Scottish grid. 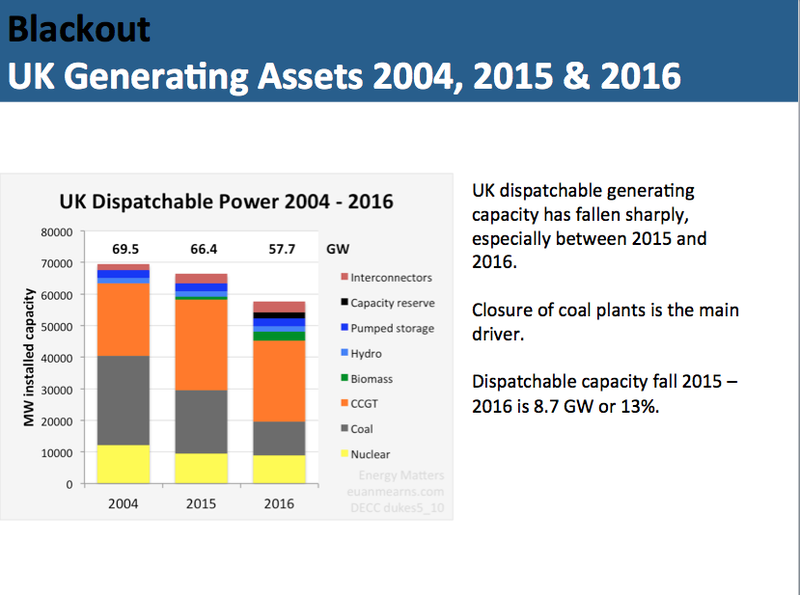 3.6 GW of dispatchable coal has been replaced with 5.67 GW of wind that is distributed along the grid network. We have a new N-S power line (Beauly – Denny) to transport renewable energy from source to market and an additional 2.2 GW HVDC line connecting Hunterston to N Wales. Stacking the capacities of the assets shown on the maps produces this picture. 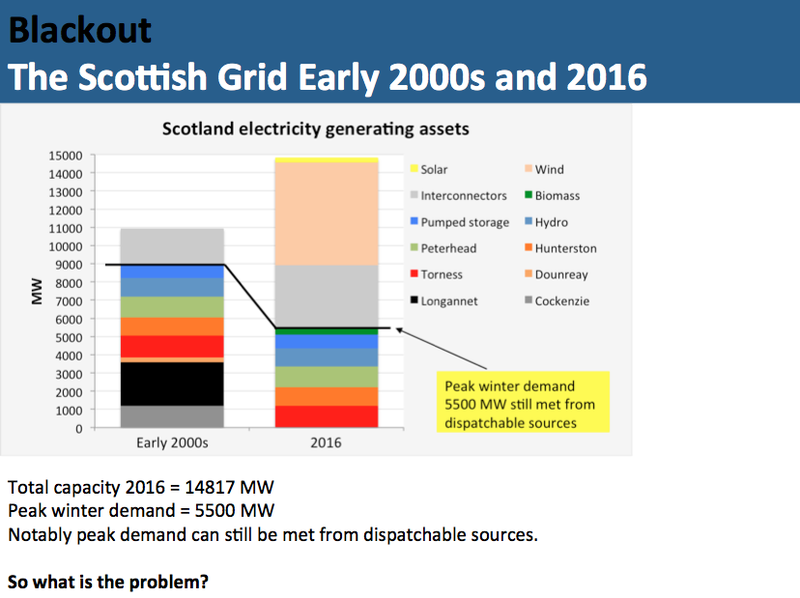 Peak winter demand in Scotland is of the order 5.5 GW. In the early 2000s we had about 9 GW of dispatchable capacity which was a belt and braces approach to security – which is how it should be. Come 2016, we see that dispatchable capacity has shrunk to about 5.5 GW, still enough to cover peak winter demand. Interconnection has grown and 5.67 GW of wind turbines have been introduced. So where is the problem? The problem arises when capacity is derated. At 6 pm in winter the Sun has already set and solar therefore has to be totally discounted. Equally, every winter there are spells when there is no wind. This too must be discounted. 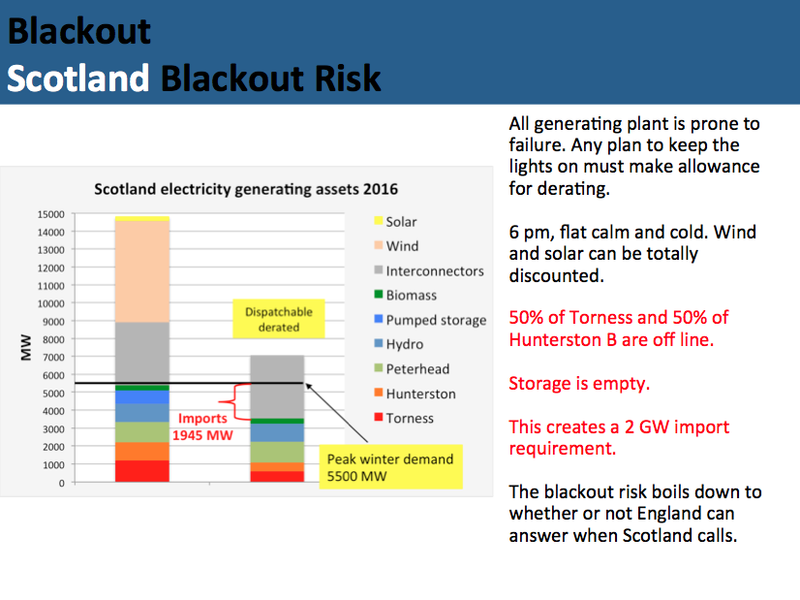 Add to that the fact that all power stations fail from time to time and we see by making some reasonable assumptions about circumstances that may arise that a shortfall of up to 2 GW generating capacity can easily arise. This creates an import dependency from England which I find gloriously ironic since the government that stands behind the energy policy has a single goal and that is to gain independence from England. Will England answer when Scotland calls? England too has been subject to the ravages of climate policies and has seen closure of many coal fired stations, especially in the last 18 months and margins there are also wafer thin. At face value there is sufficient capacity to meet peak winter demand of 55 GW, but once again derating presents an alternative picture. 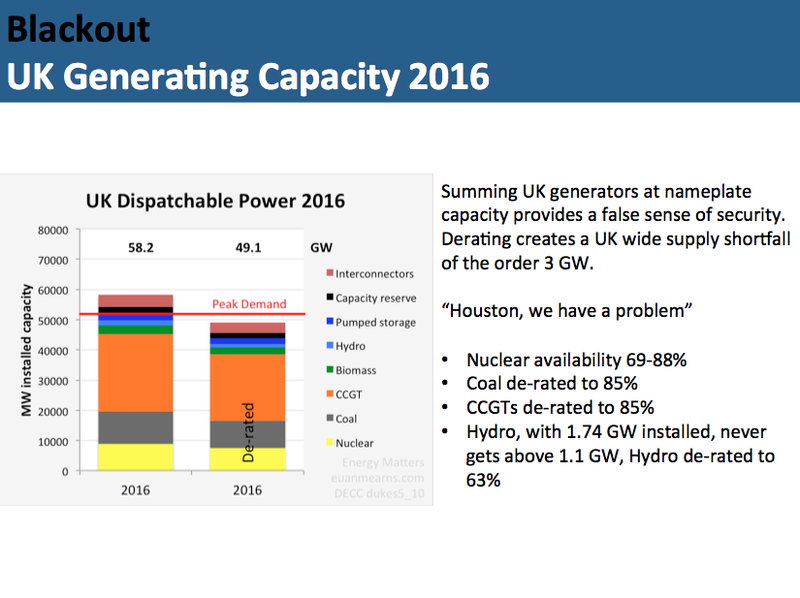 Derating UK capacity using empirical measures creates a 3 GW shortfall. And at the present time with one third of the French nuclear fleet out of action, we are struggling for imports from Europe. The pro-renewables stance of the Scottish Government is matched by their anti-nuclear position. 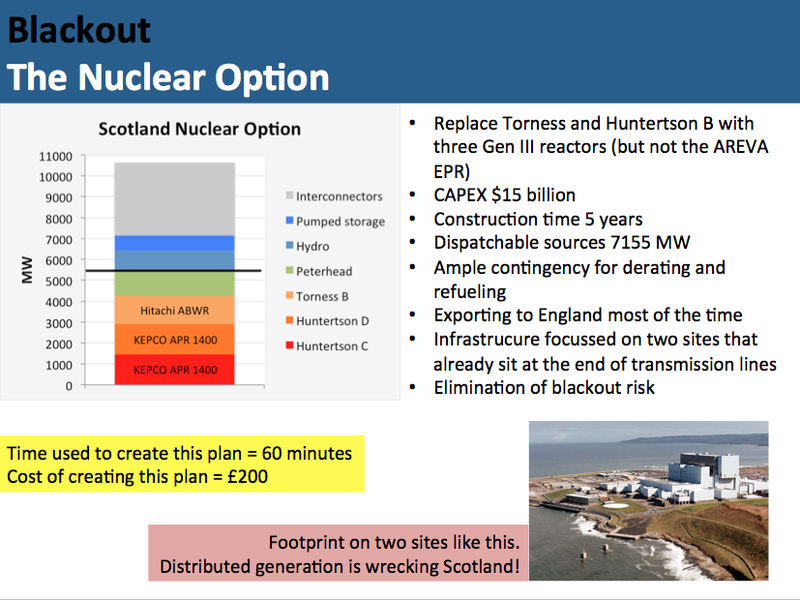 While there has never been talk of closing our two power stations, there is also no plan to replace them and Hunterston is due to close in 2023. Hinkley C and the Areva EPR have given nuclear bad press. And so I opted for Korean and Japanese designs. Hopefully both countries will relish trade with the UK post-Brexit. I once enquired about a job at a Scottish University to be told there was not much research mileage in an energy plan that consisted of only three new nuclear reactors. Are we in the state we are in because a bunch of misguided, greedy and selfish academics want to play games with our energy and economic wellbeing? 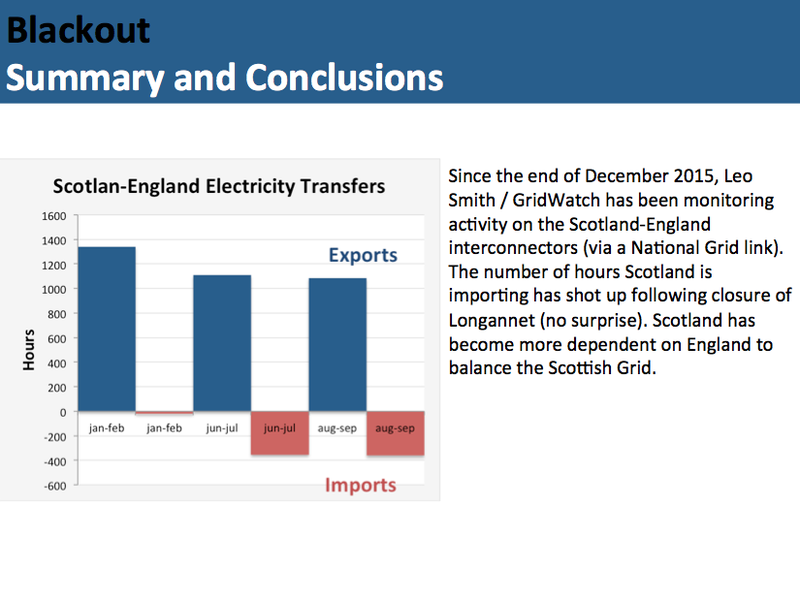 With the pending closure of Longannet, there was interest to monitor the pattern of electricity transfers between Scotland and England. A National Grid link was found and Leo Smith from Gridwatch kindly obliged to monitor it. There will be a post on this shortly. 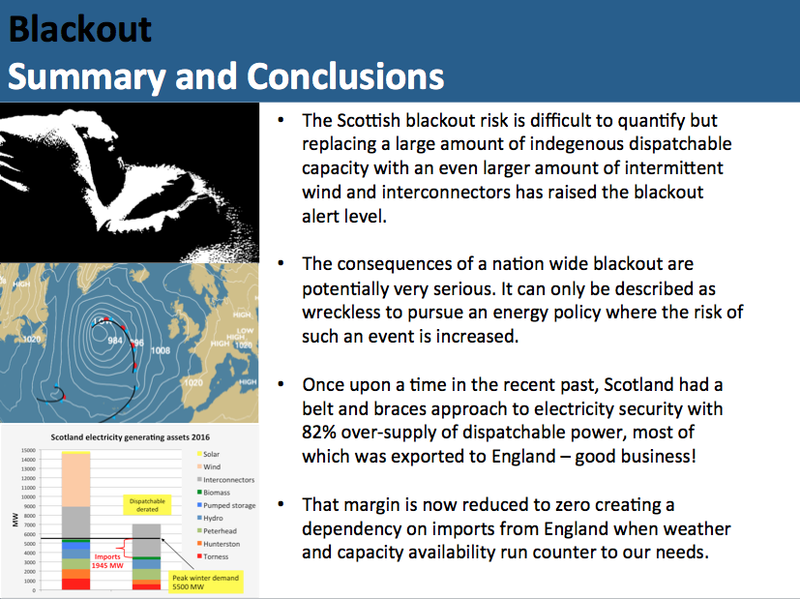 What we see is that the number of hours Scotland imports from England has shot up with the closure of Longannet in March emphasising that SNP energy policy is making Scotland more dependent on England for our energy security and prosperity. Note these are summer months and in winter, like now, that dependency will likely be more pronounced.